I've had this parrot since 1986. 25 years or so. He's "opening" up since we moved here. They are interesting creatures, and I don't know what kind of treatment he got when I got him way back then but he was always very standoffish. Now he's bonding, and shows excitement when I walk into the house. He also calls to me when he wants attention by saying hello as well as other behavioral quirks. 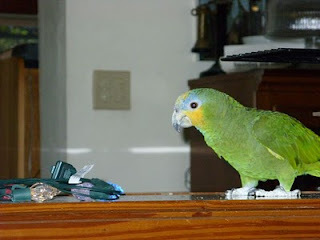 If you have ever had a parrot or for that matter any other bird, you know that they can be loud. There are certain times of day when they have the "Call To Flock", within an hour either side of sun up or sun down, when they're louder than the rest of the day. You get to understand that timing and realize that unless you want a Parrot Accompaniment with what ever you're listening to in the house, you keep the volume down. You see, my Parrot, Oscar is a Hearing Protector. If it's too loud he gets louder. I learned a long time ago that if Oscar is "singing" along to the music, it's time to turn the volume down. Having just upgraded to a new HDTV, or having someone upgrade me, I've gotten used to where I can put the volume so it does not trip the Parrot Accompanyment on. Years of practice has made me very aware of volume in the room. There's always something on, but if Oscar's chattering, I turn it down until Oscar shuts up. So lately I've gotten into the Holmes shows on HGTV. There's a lot of great information on construction on these programs, the content is excellent. I'm a bit of a DIYer around the house, if I think I can fix something I'll attempt it. After all if it is broken and I break it, then it had to be fixed anyway right? Well more often than not, I am successful and it is the instruction that I have gotten from programs like Holmes on Homes and others that have made be get better at that sort of craft. My cooking and baking articles here are at a level that is a direct result of watching the Food Channel and specifically Sunny Anderson and Giada DiLaurentiis and other programming and deciding that I want to try those recipes. My favorite food shows are when Sunny Anderson brings her friends in to "help" or when Giada DiLaurentiis brings in her wonderfully "unhinged" Aunt Raffi. That's how it is, if you cook and have help in the kitchen it is almost always a more enjoyable situation as long as you don't get "too much" help. The thing is that these shows are all running up against that balancing act of how loud I can put the TV before Oscar decides to talk back at the screen. Sunny Anderson and Giada DiLaurentiis are fine. The volume is not too loud at a conversational tone and the background music seems to add an air to the programming that does not distract from the presentation. Holmes on Homes, the older program was like this. He would bring in his team, help a family out with some very heavy duty construction on a small problem created by a bad contractor and then fix it. By fix it, I mean sometimes gutting the room down to the support beams and then rebuild the place. If I had a contractor, I'd want this guy! There's a lot of information in his shows and it makes me wonder whether our Canadian Cousins have any decent construction contractors up in Toronto at all. Fast forward to the current show, Holmes Inspection. Now he brings on his affable team including his family members and other contractors to do this same work. He's upgraded the show with some animations that show what is happening at this particular part of the house reconstruction. The graphics are usually very useful and show in detail how this part of the structure is being changed. Great, he's back, he's got a team, he's showing the family who live there and how they're being effected by the incompetent contractors and the job will be done and done right. Remember that parrot? Oscar? He's the problem. You see there's background music on this show. A constant drone of a guitar riff. So far why the complaints? Watch the show and you'll see. Most of the time, if you have music on a TV show, it will be in the background. If you notice it, it is too loud and will detract from the message. In the case of Holmes Inspection, the volume level of that snarling guitar riff is equal to or greater than the people speaking. So the volume of the show has to be turned up to try to actually pick out what Damon and the rest are saying. It's a shame because here is an excellent show with a great crew and a lot of truly good information about contracting and home repair that is getting lost because you have a first year film student that cranked up the volume of a bad music track. Once you notice that, then you start to look at the problems of a given show. The "Warts and All" syndrome where if you don't have a problem with something, you enjoy it "warts and all" but if you do, those problems become all that much more apparent. I found myself yelling at the TV saying "Why Are You Showing Me This Filler!" more often than not. They'll show a person working on a particular piece of construction. For example, you have a contractor explaining how badly a railing was installed in the house and why he's about to replace the risers and how he goes about doing it. Then they cut to him doing it. Normally they'll fade to the next aspect of the construction, but to make it even more edgy, they zoom the camera into the Drill Bit going into the wood and amp up the snarling guitar while they stop zooming in and slow the video down to slow motion. I suspect they eat up another 2 or 3 minutes of content or more each episode by showing me a drill bit chewing up some wood or a jackhammer slowly breaking up concrete. At this point, Oscar's yelling because I'm yelling at the TV. So I have pretty much stopped watching Holmes Inspection as a result. Too bad, because with a few minor tweaks it could be a great source of how to fix your house. I can't watch it with the volume turned down, I even tried turning off the Subwoofer on the TV Sound Bar and the background 'music' is still too loud. I guess I'll just have to move on. It's just way too intrusive.